Goals are essential to your success because “Success” means, “the achievement of a goal”. The first step to achieving a goal is to set it. A vague goal is useless, since it lacks clarity. Your Goals need to be specific, not vague. To help you make your goals more specific, we have created this SMART App. 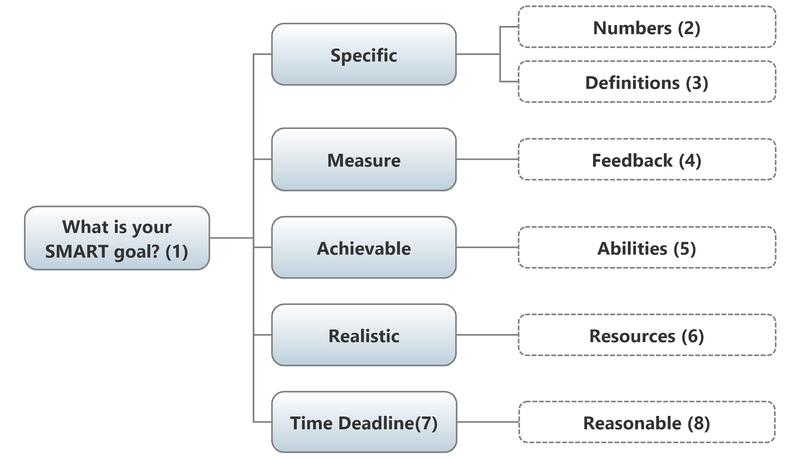 It is based upon the SMART target formula: Specific, Measurable, Achievable, Realistic and with a Time deadline. 1. What is the goal or delegated task? Write the goal as a broad statement, in one simple sentence. Quantify the goal using numbers. If possible, make the goal a quantitative goal. Put numbers on it: how many, what dates, how much, how frequently, what percentage, what rate? Name the method by which you will measure the progress. What will you take as the measure of your progress? How will you determine how well the goal is progressing? How will you communicate with other members of your team; and how often will you communicate with each other? 5. Are any additional abilities required? Do you (or the delegate) have the necessary skills, knowledge and experience that will allow for the proper completion of the goal? What additional skills, knowledge and information is needed and how will this be gained? 6. Are any additional resources required? Do you (or the delegate) have access to the necessary material resources, such as money, other people and technology, that will allow for the proper completion of the task? If no, what additional resources need to be put into place, and how will these resources be gained? What is the deadline by which the task should be concluded? 8. Is the deadline reasonable or over optimistic? Is that deadline 'reasonable' given all the facts and the existing workload? Sometimes, you need to delegates tasks. Delegation is the act of entrusting a task to another. When you delegate, you are setting a goal for others to achieve. So, you owe it to the others to explain the task in the form of a well-worded, SMART target. Then they will be more likely to complete it properly! Use this SMART App to help you describe the delegated task, to ensure that you have explained it properly, with no chance of misunderstanding or error. Drag this button: SMART Goal Web-Widget to your bookmarks bar or desktop to save it for use later. Every successful person sets goals, in aspects of their life they want to succeed in. Once a goal is set, the necessary plans need to be put in place, in order to achieve it. Make the most of your life by setting up specific goals and plans.